Broadcast in 2011 by the BBC, the eight part series Human Planet featured jaw-dropping images that demonstrated mankind’s relationship with nature across 80 different locations and covering the extremes of planet Earth. 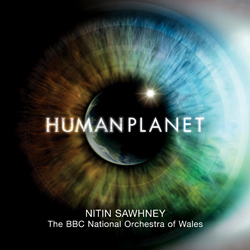 Integral to this ground-breaking natural history series is Nitin Sawhney’s stunning orchestral score, up to 50 minutes of music for each episode and all written within a hectic two months schedule. Nitin’s distinctive musical voice covers the whole spectrum of contemporary music as a producer, songwriter, DJ, multi-instrumentalist and orchestral composer. His impressive list of collaborations include working with Paul McCartney, Sting, A.R. Rahman, Brian Eno, Jeff Beck, Sinead O’Connor, Jeff Beck and many more.